Be sure to keep on checking back for the latest information. Two more stores are in the works too stay tuned. Did you know that Adventures of Shadow® is here and has been since 2006. We have sold many varieties of items over the years of the image and name Adventures of Shadow® dogs. When ever possible Adventures of Shadow® will always try to have the items made in the U.S.A. The Adventures of Shadow® is modeled after what the owner of Lassie® required that each episode, story or whatever comes out on it has to be modeled like a Sunday school lesson. It worked for Lassie® all those years and it should work now for Adventures of Shadow®. Adventures of Shadow® is a biblical family (model) of stories and products. If a person knows the Lord or does not will enjoy the stories that are told or the products. Adventures of Shadow® will never endorse violent films or video games. The star or the trademark will never be allowed to be connected with anything or star in - if it goes against biblical standards. I am also setting up things what happens when I 'Go Home' that certain things can never happen to my trademark. When a person hears the name Lassie® - What do they think? Clean family entertainment and that is exactly what I want people to think of when they hear Adventures of Shadow®. Thanks for your interest in Adventures of Shadow® and if you know the Lord or not - that is up to you - but we are glad that you have chosen to enjoy the stories, the stars, and Adventures of Shadow®. I have never really posted many of the Adventures of Shadow® item in our online stores. Some time ago I have had about three shopping cart programs. The first one had many items in the store but the company who made it went under. We then went with a different on-line cart and that one had promise and had items in the on-line store but they change things around and made it hard for people to place orders and us to retrieve the items so I started to look for the next one. I found one and so-far seems great but had a few bugs in the cart program but they have pretty much fixed them. So if it holds look for the items to be added once again. The on-line store is called “Creation Family Bookstore” and “Adventures of Shadow Gift Shop” and is located at www.CreationFamily.com. Did you know that Creation Family Bookstore had a store at the Bayshore Mall in Eureka, CA? We were sub-renting with the Treasure Trove and we were selling and had on hand items on hand with Adventures of Shadow® on it besides many other items that we carry. The majority of the items are dealing with Creation Research. We were at the Bayshore Mall from October 2009 - June 2010 Then we were near the famous Eureka Inn in Eureka, CA from July 2010 - May/June 2012 on E Street. Because of the new location never really caught on like it did when we were at the mall I pulled out. Even before I was at either location I had items of Creation Research and Adventures of Shadow® items on hand but after I pulled out I still had items on hand but went back to more selective items of both Creation Research and Adventures of Shadow® items. The items would be on hand at events I would go to and in September I would start to cut back on all items. If people E-mail or call about what they want I would do special orders for whatever they want if by chance the item was not in stock. I always have some items on hand or they can place a special order. To make it easier now I have set up a Café-Press on-line store and then if someone wants a certain photo or whatever I can create it for them pretty quick and they can then have the image put on many items that I setup. The address is http://www.cafepress.com/adventuresofshadow Currently I have my pictures and other items set-up differently mainly due to the current economy. If anyone sees any pictures they like they just have to contact Odonnell Entertainment® or Adventures of Shadow® they place an order I will then have the item created. Let’s say you like a certain picture and you want a T-Shirt, stickers, pen, etc. I will then place the order and after the item is paid for the order will be placed and turnaround time is about a week or two before your order will ship. The items will only be available in family type product only. This is the time we start to bring in the items again and now starting to get a selection on hand again of new items for Creation Research material and Adventures of Shadow® items for the upcoming season. The current water-bottle with the current label have been selling - since 2013 and has been sold in 16 states and has gone overseas. We still have very few left of Adventures of Shadow® Limited edition water bottle is in our web store. The water company did a few runs for us back then - they went under and in 2013 we went with a better water company. We have always had water in stock but the replacement water bottle for the label that says Batside was created but the water company promised to re-do them but never did. We had a distribution issue and in 2013 we solved by going with the new company. As mention we have always had water in stock. Did you know we had advertise in phonebook? - until a few years ago - main reason stopping - no one uses them anymore. We also advertise in magazines. The Adventures of Shadow® calendar is in the works and the 12/16 page calendar for 2019 will be available late 2018. One page calendars for 2018 a few are left the new one page calendar will be late 2018 too. We have had calendars in all the past years but they have been just one page calendars, except one year, and been the same picture or different picture that has been on the Christmas Cards each year. Did you know? We do Adventures of Shadow® Christmas cards every year. The trademark logo of “Adventures of Shadow®” has been around since mid-2007 for a special lighthouse DVD. This program and the other lighthouse video that is produced by Odonnell Entertainment® and Adventures of Shadow® is called “Last One Out Turn Out The Lights”, which has been available since 1999. Both of these programs are now revamped and includes all three stars of Adventures of Shadow® and was re-released in 2016. The Adventures of Shadow® dogs have also been shown on our local channels mostly as part of an introduction and closing of the programs we put on TV. The images and videos have been sold in some of my video productions in the past and future productions. 1. 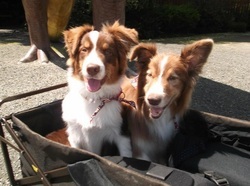 Had produced programs using both dogs and they have been some video productions. 2. Some people had mistaken that I have not filmed or will film the Adventures of shadow® dogs until I have three dogs available that is not true. I said that once the current dog is trained she will be more easily be filmed. But I have been filming her and the original dog for years. In time I would like to have three dogs trained at different ages so they all can be in the same production if needed. They did for the Lassie® series and movies. Once they got going they tried to have three dogs ready to go. A NEW PROGRAM is still the works and is basically a transition program and will tell about whom “Shadow” Stormy was and her life, when she meets the new puppy Shadow “Scamp” plus Shadow 'Starrr' which will show all three of them having adventures together. It will also have some of the footage of them together just before Shadow is put down. The production may show Shadow being laid to rest but have yet to decide if that will be included. The film release is schedule to release TBA. The title of course is “Adventures of Shadow®”: The Legend of Shadow. A variety of new items are always coming out. So be sure to keep checking back here, the main website www.AdventuresofShadow.com The adventures will continue… no place these dogs have not gone or will go and will keep you guessing. So if you would like to place an order for post cards, stickers, pens, T-Shirt, calendar, water bottle along with other items you would like to have with the picture you like send me a message or an E-mail to shadow@shadow.ws or go to http://www.cafepress.com/adventuresofshadow Items and many photo's will be continuing being added soon. Majority of our funds are being used to deal with false claims about Adventures of Shadow® - We have a variety of the items on hand, The sales will be done as they have been done since 2007. The item will be created once an order is placed and person will not be charged until the item is ready for shipment. As mention earlier I have been doing it this way for all these years due to the economy. We did a 34 day road trip went about 8,000 miles and met a variety of people. Pictures, water bottles, ink pens, spiral books, T-shirts, to name a few of the items that were sold and some given away during our trip. Some of people are taking them to Switzerland, France, Italy, to name a few of the places. We even gave out hundreds of our business cards - I talked to well over 400 people about Adventures of Shadow® and Adventures of Shadow: Friends of Canine Memorial. Adventures of Shadow® War Dog Memorial - Major things in the works stay tuned. For now, I Shadow “Scamp”, say “Arf, Arf for Now and be sure to place an order today!. Note: Only the Face-book page is kept up with the latest events and what is going on. This site was last update April 2018.